Those are the powerful words New Zealand Prime Minister Jacinda Ardern told the crowd of thousands of mourners who had gathered Friday for a Muslim prayer service in front of the Al Noor Mosque — one of two mosques where a gunman who espoused white nationalist views killed 50 worshippers last week. It’s also a sentiment that has been echoed by thousands of New Zealanders from all walks of life in the week since the atrocity. And it’s a sentiment that represents a stunningly powerful rebuke of the alleged shooter’s ideology of division and hate. New Zealand Prime Minister Jacinda Ardern greets members of the Muslim community as she attends Islamic prayers in Hagley Park near Al Noor Mosque on March 22, 2019, in Christchurch, New Zealand. 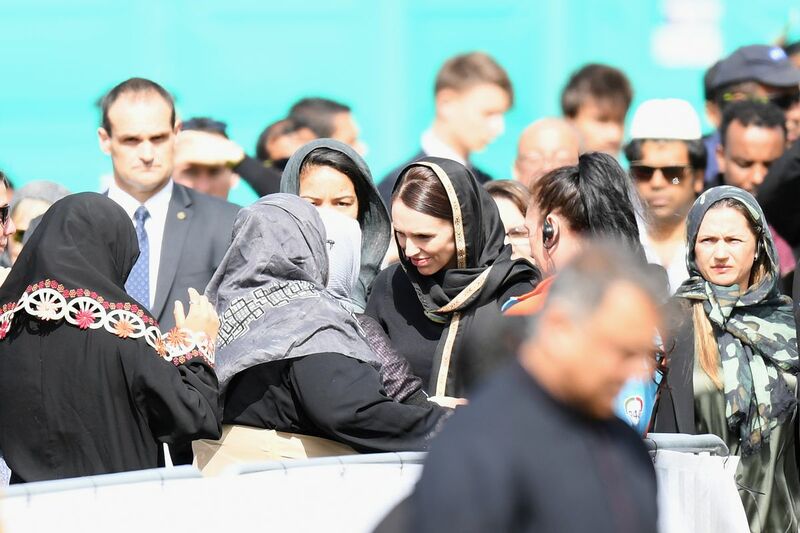 “According to the Prophet Muhammad … the believers in their mutual kindness, compassion, and sympathy are just like one body,” said the prime minister, who was dressed in a black headscarf, at the huge gathering in Christchurch’s Hagley Park on Friday. Thousands of other non-Muslim women, from police officers to TV news presenters to everyday citizens, followed Ardern’s lead by wearing headscarves Friday at the memorial. They also donned headscarves at similar events at mosques around the country, out of respect for and in solidarity with the Muslim community. The Muslim call to prayer, or adhan, was also broadcast on national radio and television across New Zealand at the beginning of the memorial service, followed by a two-minute moment of silence. And around the country, New Zealanders came out to perform the traditional Maori ceremonial dance known as the “haka” to honor the victims of the shooting. Maori are indigenous to New Zealand, and their culture and traditions are a big part of that country’s national culture and identity. Numerous hakas, many of them impromptu, have taken place around the country in the week since the attacks — performed by everyone from students to leather-clad bikers. All of these gestures of solidarity have been a balm to the hearts of the country’s tiny Muslim community, which makes up roughly 1 percent of New Zealand’s population. “We are brokenhearted, but we are not broken. We are alive, we are together, we are determined to not let anyone divide us,” New Zealand imam Gamal Fouda, who led the Friday service in Hagley Park, told the crowd in a moving 20-minute speech. “Thank you for holding our families close and honoring us with a simple scarf,” Fouda said. These expressions of solidarity also do something even more powerful: They serve as a forceful, unequivocal rebuke of the alleged Christchurch shooter who killed 50 Muslims and injured dozens more. This idea is a cornerstone of white nationalist ideology around the world, and it’s a theme that runs through the alleged shooter’s entire manifesto, which provides the best insight we have so far into his alleged motives for the attack. It’s a horrifying message of hate. But it’s also, just looking at the numbers, absurd. Remember, Muslims make up a minuscule 1 percent of New Zealand’s population (and in Australia, where the shooter is actually from, Muslims make up around just 2.6 percent of the population). Yet the myth of an impending “cultural replacement” persists — and was evidently strong enough to compel the author to commit mass murder. But New Zealanders, with their expressions of unity, just delivered a powerful blow to that myth. The students and bikers and indigenous Maori who performed hakas to honor the victims; the police officers and TV news presenters who donned headscarves in solidarity with their Muslim neighbors; and the thousands of other New Zealanders who showed up for Friday prayers at mosques across the country sent a clear message: The Muslims in our community are not invaders. And they’re not “replacing” anything. They’re New Zealanders. They’re us. 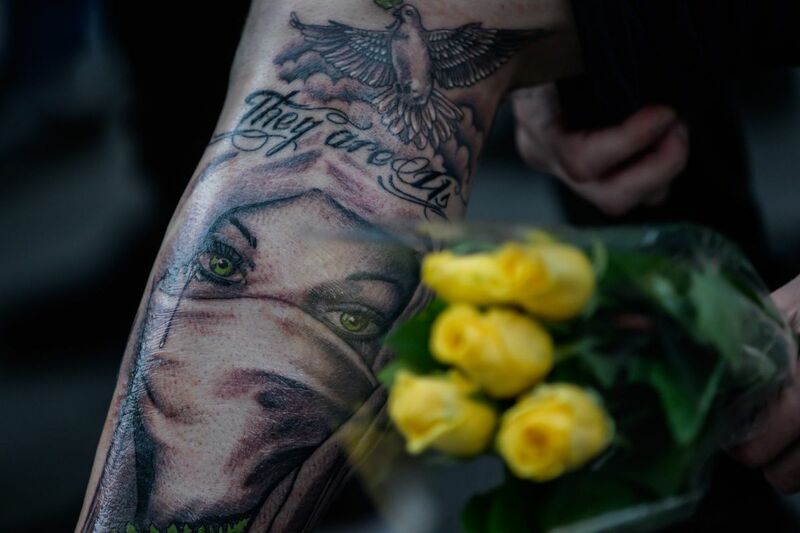 Ex-gang member Jacob Leo Skilling, 26, shows his freshly inked tattoo of the face of a Muslim woman wearing a face veil, with the words “They are us,” after the haka was performed by biker-gang members at a gathering in Christchurch, New Zealand, on March 20, 2019, in tribute to the mosque shooting victims.